A lack of collaboration between the textile and electronic industries continues to be one of the main obstacles to progress in smart garments, experts believe, although once this happens they could enter the mass market within five to ten years. 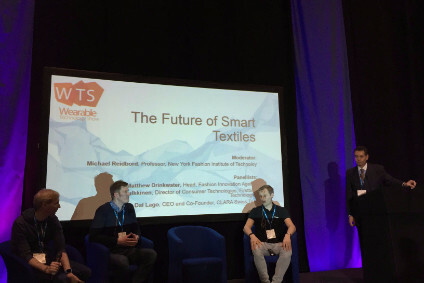 That was the message from a panel discussion on the future of smart garments at last month's Wearable Technology Show, which claims to be the largest event of its kind in Europe. While everything from performance enhancing sportswear to intelligent insoles was on show, questions were raised about the types of wearable technology the fashion industry actually needs. "It's 2016. Where is this smart clothing? Where can I buy smart clothing? And if I can actually buy smart clothing, what do I want it for and what's it going to do?" asked Matthew Drinkwater, head of the Fashion Innovation Agency at the London College of Fashion. The Fashion Innovation Agency was borne out of a European funded project to be the bridge between the fashion and technology industries. It uses technology to help fashion designers make their products, show their merchandise and sell their collections. "I understand the needs from a health and wellbeing perspective; I still have some really big questions about the needs within the fashion industry," Drinkwater noted. And according to Michael Reidbord, professor at the New York Fashion Institute of Technology (FIT), there has been little or no progress in the area of smart textiles since the same conference took place last year. "We haven't made any progress at all in what's happened in smart textiles," he said, adding: "What we really want to do is take conductive yarns and conductive fibres, and be able to embed very small batteries and very small CPUs (central processing units) and all kinds of Bluetooth technology...It hasn't happened." The reasons why it hasn't happened: it's expensive to produce smart garments and it takes enormous amounts of research and development. Reidbord argued that while there are ways to produce smart garments in high volume, the technology isn't at the point where it can be knitted, sewn and welded together correctly. This time last year, he said, there were two independent supply chains: electronics and garment manufacturing. "They never touched. They never came together at any point," he explained. And although they are now starting to come together, Reidbord highlighted the disconnect between the two industries. "Where are the Ralph Lauren garments? They're on its website and they cost about US$600 and you've got to buy one for every day of the week." Last year the US apparel giant launched what it described as a new "groundbreaking" smart shirt that merges advanced apparel and digital fitness technology into one garment. Reidbord added: "Apparel and the textiles have to be aesthetically pleasing. We can no longer put on clunky big things that don't fit well but have functionality. We're talking about beautiful garments and just having things that make sense, that are washable, and that you want to put on so that it doesn't even become a wearable, it just becomes apparel." Sven Bohmer, responsible for sales, research and development at Statex, which supplies silver-coated yarns and fabrics for use in medical and technical applications, believes the smart textiles market "still needs time." It will probably be five to ten years before smart textiles hit the mass market, he added, because "there needs to be more closer work with the electronic industry and textile industry." Drinkwater supports this view: "What we really need to do is collaborate, create [and] get together. We need to iterate. We need to start making products and getting them out there." "But really what the industry needs is more opportunity for fashion designers to start working with this technology to understand where it could be applicable. I think some of the most exciting developments over the past year have been actually seeing a product come to market." "The more we can see that kind of thing happening, the more progress we'll make."